An aircraft had to make an unscheduled stop after a passenger was bitten by a stowaway snake. The traveller from Jordan had hidden the reptile in his hand luggage and sneaked it on board the EgyptAir flight. The plane should have landed in Kuwait but when the air stewards heard the passenger screaming out in pain, the plane was diverted to the Egyptian city of Hurghada. 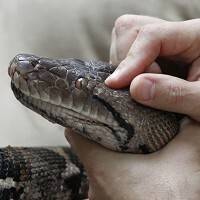 The bitten man was rushed off the aircraft for emergency medical treatment and the snake was confiscated by the authorities. Although snakes are unusual aircraft passengers, it is the second time this year that snakes have made their way onto flights without the crew knowing. Airport workers in Glasgow discovered a snake hiding under the seats on a plane which had travelled from a Mexican holiday destination. With fellow passengers like that, holidaymakers would be wise to make sure they have a good travel insurance policy.